Why would you want to eat like them? 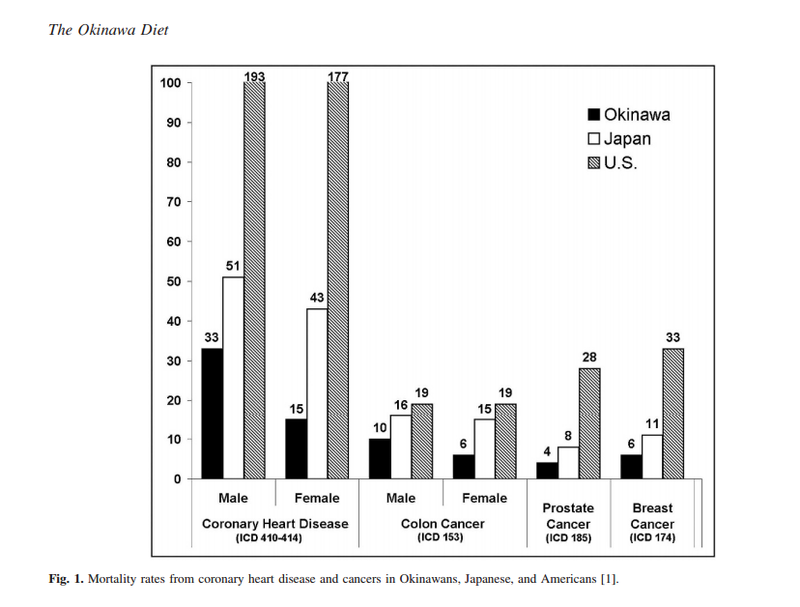 What do the Okinawans with long life expectancies eat? Vegetables, fruits, tofu, mushrooms, etc. are allowed to be eaten as much as one pleases (while still following the ‘Hara hachi bu’ rule or eating until you are 80% full) whereas cookies, chocolate, nuts, and oil should be rarely consumed, if at all. Food should be thought of as medicine, not a fleeting moment of pleasure filled with sugar and fat. The Okinawan diet consists of mixing a variety of vegetables and seafood in order to obtain a balance of necessary vitamins and minerals. Their healthiness is not obtained in the Chinese traditional way of utilizing herbal dispensaries because just their food is enough. Enough to heal, prevent, and feel good for years and years. Each vegetable and fruit have a different amount of various minerals and vitamins, tofu is prepared differently, fish and pork are eaten rarely, and low-calorie foods like konnyaku and moyashi are often unknown in other parts of the world. Many of the vegetables and fruit are also unheard of in many countries, making Okinawa an island of almost untouchable health. You cannot walk into a store in the US, England, or Australia and expect to always find Chomeiso or Getto. These foods have barely made their way past Taiwan and China and few other Asian countries. Our website is to help people living in other countries to start thinking about how to improve and maintain health, lose weight, live longer, and think smarter about what they eat. Willcox, D. Craig, et al. “The Okinawan diet: health implications of a low-calorie, nutrient-dense, antioxidant-rich dietary pattern low in glycemic load.” Journal of the American College of Nutrition 28.sup4 (2009): 500S-516S. Lehman, Shereen. “The Okinawans Live Longer Than Most, Maybe It’s Their Diet?”. Verywell. N.p., 2017. Web. 7 Apr. 2017. “Okinawa Diet Food Pyramid”. Okinawa-diet.com. N.p., 2017. Web. 7 Apr. 2017. * The statements contained herein have not been evaluated by the Food and Drug Administration. The information contained in this website is intended for education, entertainment and information purposes only. This information is not intended to be used to diagnose, prescribe or replace proper medical care. The plants described herein is not intended to treat, cure, diagnose, mitigate or prevent any disease. We’re a bunch of volunteers and opening a brand new scheme in our community. Your website provided us with helpful information to paintings on. You have performed an impressive process and our entire community can be thankful to you.